The social structure of a wolf pack is one of the most fascinating that has ever been observed. They have a very strict level of hierarchy that has to be adhered to by all of the members of the pack. This may sound harsh initially but it is a method that allows these packs of wolves to be able to survive. The leader of the pack is the alpha male and his mate is the beta female. Many believe that the social order of a pack is determined by fear and dominance of the one in charge. However, it isn’t necessary established by an attack on one and the winner is the leader. It is much more complex than that. The lowest ranking individual in a pack is the omega. Through careful research, experts have found that this type of social structure helps to promote unity and social order. It also helps to reduce conflicts and to lower the chances of aggressive behaviors occurring among the members of the pack. The upper level of social structure doesn’t change very often. However, it can quite a bit at the lower levels. What is also interesting is that there are two separate hierarchies within any wolf pack. There is one for the males and one for the females to follow. All of the wolves in a pack have a job to do and a role to fulfill though. In fact, it is the strong bond on a physical and emotional level that allows these animals to stay together. Without a strong social structure in place they would want to go off on their own. The fact that wolves are very social animals by nature is part of why this works. They long for the interaction with each other. They will spend a great deal of their time communicating both verbally and nonverbally with each other. While they do use sounds and body language to stand their ground, it is seldom that problems get to a physical level within a given wolf pack. The exception to this is during mating season. Some studies show that mating can occur with other members of the pack but mainly it is only the alpha male and beta female that will do so. When you consider that a wolf pack can have many members, this type of social structure does make sense. It helps to ensure every single member is aware of what their role within that group really is. You may find it interesting to learn that the young pups often have a great deal of freedom and get lots of benefits. This is because they are the offspring of the highest ranking members of the wolf pack. 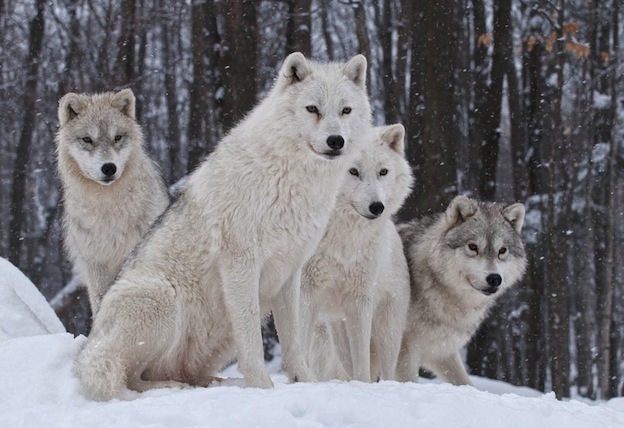 The home range of a pack of wolves can overlap with that of other wolves. As long as food is plentiful they will usually ignore each other and continue on their way. When food is scarce though they may battle to determine which pack has the right to feed there. The overall social structure if a wolf pack doesn’t change very often towards the top of it. There will be times though when the leader will be challenged by others. The lack of habitat out there as well as food in some areas can also limit the overall growth of a given wolf pack.